I really can't share much about today's game at the Games Keep in West Chester, Pennsylvania. Not because I don't want to, but because we took part in a playtest of Brendan LaSalle's adventure The Inn at Five Points. Hell, I think that even sharing that much may be too much. We'll see if I get struck down by the Dark Master. Anyway, here's what I can say. The adventure started off at Black Sand Port, with the party invited by Princess Kaeko of Fu Lamia to join on a quest for the Explorer's Guild. The team would need to travel to the Great City, however, which mean a week or so on the road headed west. That's where the adventure took place... on the road. I guess that's really all I can share, this being a super-secret playtest, and all. But there were a lot of quotes! "It's a good thing our second cleric isn't here." - Will, missing Bueno's healing abilities with a TPK nearly in process. "I have no healing magic. I only have fish." - Will only speaks the truth. Sound's fishy to me." - Now we've got Ryan joining in the fish talkin'. "I have a nine foot and eleven inch pole." - Because Steve James lost an inch. Cody: "That should be the name of the adventure." I wonder if the Black Crows could help with this." - Rob meant his book of Black Crows, not the band. Will: "Why walk when we can summon an eel escalator?" Who was the mysterious thief that took Marco's cursed Necromancer's Dagger, and why did she want it? Had a cursed necromancer's dagger, but it was stolen by a thief at the Inn at Five Points. Either Moon Slaves of the Cannibal Kingdom or Blood for the Serpent King. From left to right: Jen, Rachel, Shannon, Cody, and me! Last night I tried my hand yet again at a style of game-play that typically resides outside my game mastering repertoire: HORROR. 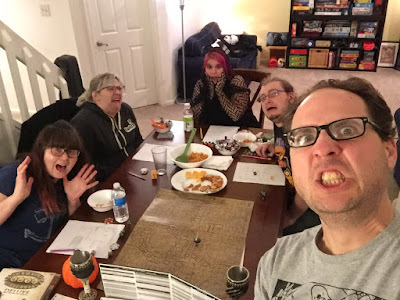 If you would ask my players about my GM'ing style, I think you would hear descriptions like zany, over-the-top, outlandish, comedic, mashed-up, or weird. Now, I don't have any issues with these descriptors and I actually cherish the last one. 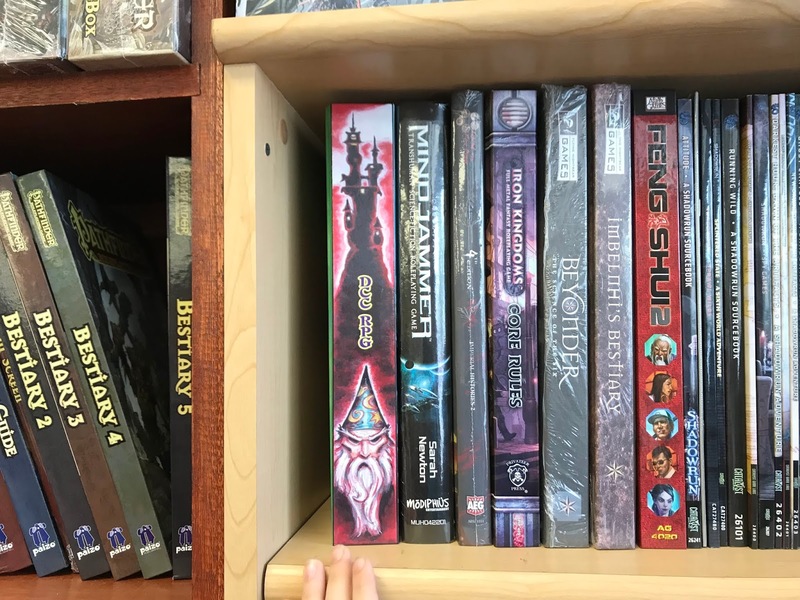 That's probably why I'm such a fan of Numenera, which is a game that's all about unleashing the weird and bizarre. Running a good horror game requires setting the proper mood and building tension. I often find this challenging as I love to keep things fun and funny and I am quick to crank these up to an eleven. I'm not saying that I can't, or haven't run a decent horror game before, but I always feel like I'm working at it, sometimes way harder than I should. But last night's game went so well, and all I really did was make a few tweaks to how I usually run my games. I thought I'd share. My adventure was based on a single page of notes, cobbled together to describe a story that has been brewing in my head for the better part of a decade. I am a fan of history, especially alternate history scenarios. One such scenario is Operation Sea Lion, which I first read about in Weird War Two: Blood on the Rhine, a D20 system campaign setting from the early 2000's. Operation Sea Lion was Hitler's proposed German invasion of Great Britain, to have occurred after the Battle of Britain. Weird War Two: Blood on the Rhine suggests an alternate campaign where the player characters are fighting in a resistance against Nazi occupation in England, perhaps leveraging English and Celtic mythology and stories. I kicked around the idea of using the updated Weird Wars: Weird War II setting for Savage Worlds, perhaps tossing in a few dashes of Rippers Resurrected. But in the end, while both settings offered tidbits of theming, I built everything using only the Savage Worlds Deluxe rulebook. I offered pre-generated player characters, and if you'd like to use them in your own game here's the link. 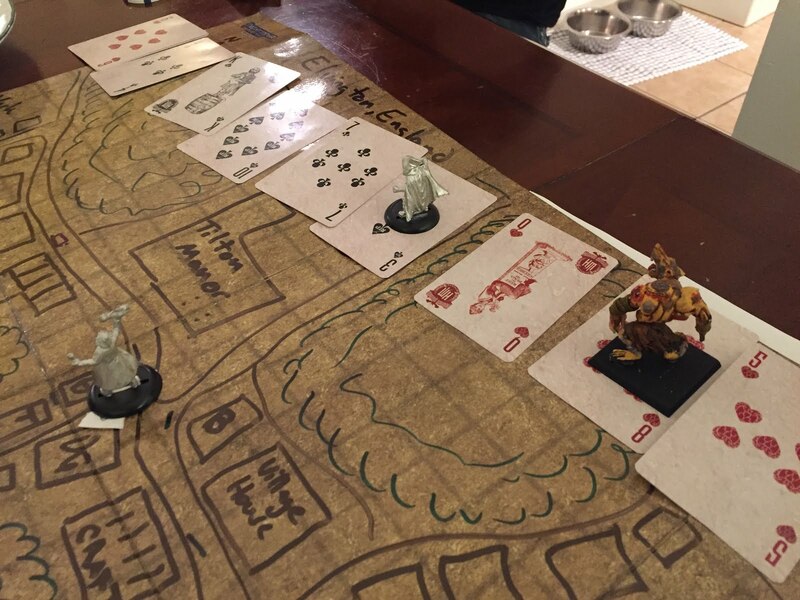 Each PC has five open pieces of backstory that the player must determine prior to the session. This way, there's a bit of customization even with some pre-gens. I think I'll be using this concept again. The original inspiration for this adventure was this amazing cover art for one of my favorite d20 products of all time. It's October, 14th, 1940, and the player characters are hanging out in a pub in Elvington, England, just east of York. It's late. The mood is dire. Just a few weeks earlier the last remnants of the British Expeditionary Force, along with their French compatriots, were defeated and captured at Dunkirk. The Battle of Britain is in full swing, and it appears that a Nazi invasion attempt is inevitable. They are covered with angular, reflective surfaces that scatter radar. Each airship has a massive, thirty-foot wide disk suspended directly beneath the craft. A long cable and winch can lower a ten-foot wide cage down to the ground, releasing the airship's most secret weapon: a single WEREWOLF! That's essentially the gist of this adventure. The Nazi's plan to secretly release nearly invincible werewolves into the countryside to cause chaos and carnage in England's northern towns while focusing their invasion on the southeastern coast. When you think about it, werewolves are pretty much the supreme super-soldier. They are fast, vicious, powerful, and they can't be harmed by anything save for silver. Just how many silver bullets do you think are in the English countryside at any given time? As soon as the werewolf is released into the countryside it starts murdering civilians. The player characters must either deal with the creature or flee the village and get help. The choice is theirs. I made just two tweaks to the werewolf featured in the Savage Worlds Deluxe rulebook. The werewolf may be on a murdering spree, but he is still intelligent and communicates and coordinates via a radio with "command" located back on the zeppelin. The werewolf can only be active (in hybrid-wolf form, not human) when there is a full-moon visible. Since it's not the night of a full moon, the Nazi super-scientists have figured out a work-around to this problem: giant moonlight generators hoisted below each zeppelin. I wish I had a better map for you. I don't. This is what I have. Maybe if I do anything with this adventure you will get more. The squares are buildings. That's what I got. 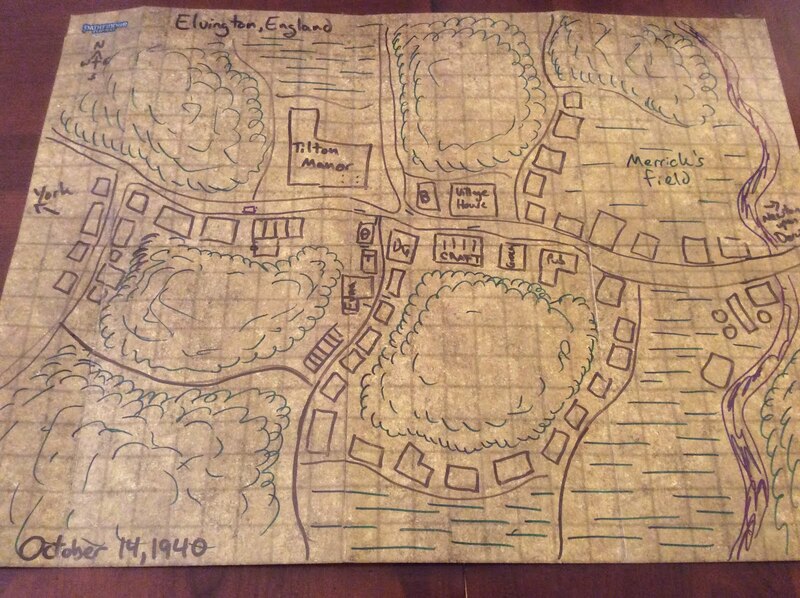 This is essentially a "one-sheet" for Savage Worlds, and so it leaves a lot to the GM to flesh out the village of Elvington. It also leaves a lot to the players to figure out the best way to deal with the problem, or escape. That said, there is an order to which the events unfold that will help move the adventure forward. The adventure starts with Stephen, son of the pub's owner George, rushing into the pub screaming that the moon has disappeared. The PC's may notice that the moon (which just a few moments earlier was a waning gibbous), is no longer in the sky. Weather conditions are poor, and even though it is evening, it's still a bit overcast, so it's hard to make out any shapes in the sky which is why the zeppelins are not clearly visible even though one is presently eclipsing the moon. Moments later the moon reappears, and the PC's may decide to further investigate, or just go back to drinking. A few minutes later, the boy is screaming out that there is a second moon in the sky, a full moon hanging above just to the north, which doesn't make sense because it's nowhere near the ecliptic. With the haze there are no features visible on either moon, neither the real one nor the fake. Both are roughly the same size in the sky, however. As the PC's go outside to investigate, they will hear a lot of the village's dogs barking, the animals unnerved by what is going on in the sky. The first sign of something "wrong" is that the dogs to the north start to bark less and less. This is the werewolf killing them. The werewolf will begin to silently enter homes and businesses, killing residents. The first sign of this will be when the PC's approach one of the buildings near where the dogs have stopped barking. The building's light's are on, and everything seems normal, however as the PC's observe closer there will be a splash of blood on the window, and all the lights will go out on the inside of the house. 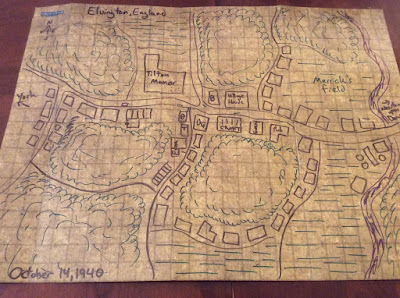 The GM is free to populate the village with any buildings that they see fit. For this scene I had it be a manor house. After killing off the inhabitants of three homes, or engaging the PC's once, the werewolf will attempt to retreat so that it can be extracted by the zeppelin. The second moon will then disappear. A few minutes later, the moon will appear to the south, and everything starts all over again. The werewolf will then pursue the PC's actively. A squad of 4-6 Nazi soldiers will quietly enter the village to review the damage caused by the werewolf for study. I kept them always out of reach, but they would turn on lights and could be seen in the windows of buildings where the murders previously occurred. If encountered, figure they have d6's in everything except for Agility, Shooting, Tracking, and Stealth. For all of those they have d8's. They are armed with bolt action rifles (2d8 dmg). Don't let the soldiers get caught until the PC's encounter the werewolf directly. The PC's need to either work out a way to kill the werewolf (a serious challenge given that they are just in an English country village), or flee (which will initiate a chase, as the werewolf can run at the speed of an old car on a country road). At the moment when the player characters have either defeated the werewolf, or successfully outrun him as they flee Elvington, the sky clears up and dozens of additional moons appear... as well as the zeppelins themselves. The invasion of England has begun. In our game last night, the PC's realized that something was wrong and immediately started investigating. The PC's phoned the police for assistance, and then went outside to take a look around. They took the strangeness seriously after witnessing the murder at the local manor. The splash of blood on the glass, and the lights going out spooked all of the players except for my wife. She approached the glass and then knocked on the door. 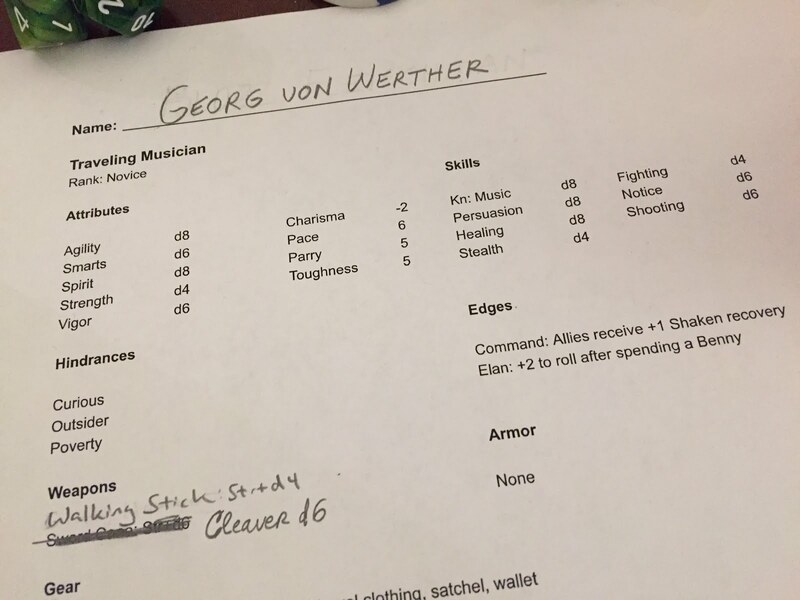 So I had the werewolf smash through the glass and slash her character (Georg Von Werther) across the back. The PC's then fled to a butcher's store and armed themselves with cleavers. Running over to the pub they convinced the pub owner to lend them his shotgun. That's when the party tracked the creature to a postal office and tried to engage it armed with meat cleavers and a shotgun. Their ineffectiveness at harming the beast caused quite a stir, as did the near death of Shannon's player character to a vicious attack. The plan shifted from "fight" to "escape." 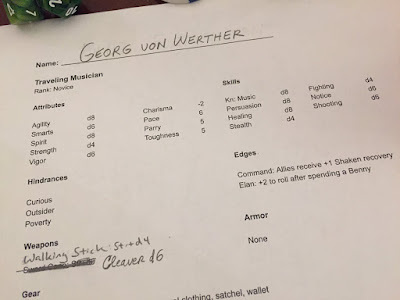 The team noticed that the werewolf was speaking German through a radio, and since one of the PC's was Austrian, he was able to work out that the werewolf was intelligent. 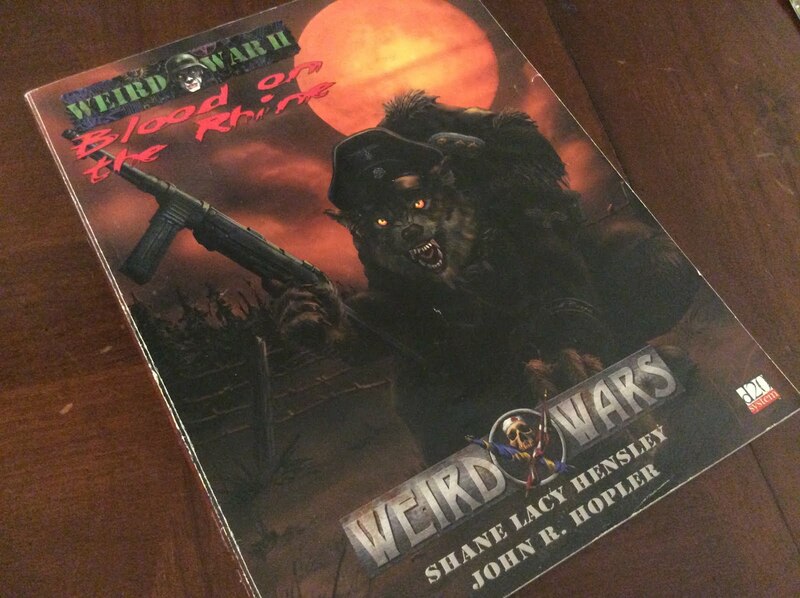 When the werewolf was shaken by a shotgun blast, the party ran to a nearby car. One of the PC's bravely stole the radio off of the werewolf just before everyone fled off. 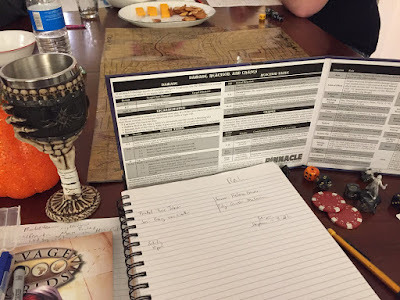 For the flight out of town we used the updated Chase Rules from the Savage Worlds Adventure Edition, which I thought played rather well. I look forward to using them again. To shut down the werewolf the party's Austrian musician mimicked the voice of the werewolf (a really hard persuasion test) through the radio asking for the moon to be switched off in German. The light was shut down, the werewolf stopped chasing. The realization that the moon, and dozens like it, were all created by Nazi zeppelins was both an awesome plot twist as well as a horrifying image. 1) Share nothing with your players about the adventure. I didn't tell them the title (of course I didn't have one), nor did I give them any spectacular backstory that would've made it seem like this was some kind of supernatural adventure. Obviously this wouldn't work for an ongoing game that already includes the supernatural, so maybe this is cheating. But it worked for me this session. 2) Don't let your players break the mood. This was key. One time when I was trying to run a serious Ravenloft campaign back in the mid-2000's a player decided his character would sound like Ned Flanders from the Simpsons. I didn't put a stop to his antics then, so the game died on the vine. Last night my wife was initially going to name her Traveling Musician "Blooz Traveler." Yeah, that wasn't happening. I informed her that she needed to keep things at least a bit more serious. So she modeled her trombone player after The Sound of Music. 3) Keep the frightening scenes just out of reach. Whenever the players witnessed something terrible they were not in a position to intervene. Save for that first scene with the blood splash on glass, the next two times they saw the werewolf, it was at a great distance. They couldn't make out just what the thing was, but they saw the victims being mutilated from a couple hundred feet away. I think this helped generate some helplessness that was a lot of fun. 4) Allow for occasional goofiness outside of the game, but don't let it invade the adventure. Playing games is fun, and even in a serious horror adventure, there should be room for a little lightheartedness. But I didn't let it drift into the game itself, or at least not too much. There were definitely a handful of funny sequences in game, but nothing too outlandish. 5) Reveal everything methodically. It's okay to crank things to a 4 instead of an 11. Be careful in how you share details about what the PC's are encountering, especially when you are using a monster. I definitely had to squash my urge to reveal too much at once. 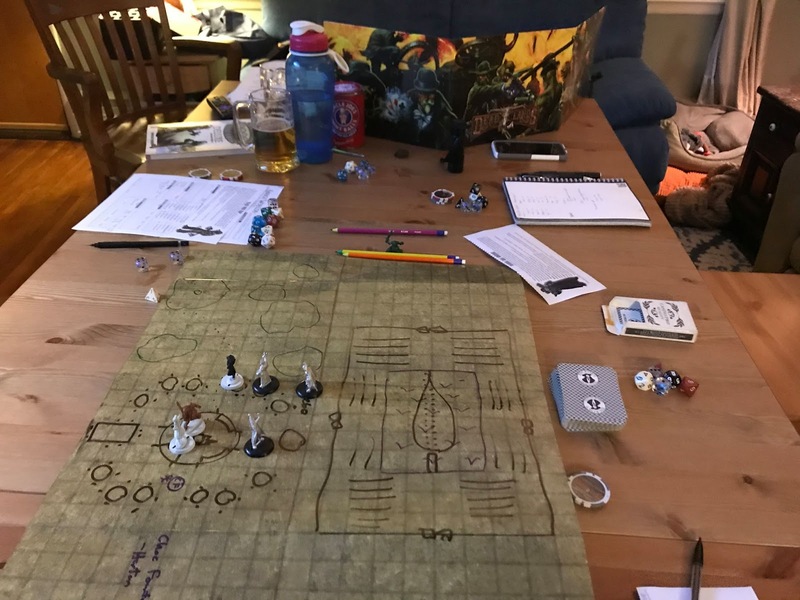 When the players first encountered the werewolf at the manor, if I had the creature reveal itself right then and there the battle would've been long and protracted and would have smashed the chance for mystery. I figured that once the party realized it was a werewolf, they would've gone straight hunting silver. Instead, they armed themselves with knives, cleavers, and the shotgun, hoping they would do the trick. They didn't. 6) You can crank in reverse. My typical adventure is a continuous escalation towards victory. There's a problem that appears, and the players work towards resolution. My goal last night was to offer plenty of moments where the tension deescalated. From the disappearance of the second moon, to giving the PC's time to reequip themselves, I tried to leave moments for the tension to "reset." So I'm tossing this back to you. What do you believe makes a good horror game? What is the best horror-themed RPG session you've experienced, and what made it different from others? If you are a GM who runs lots of horror games, how do you set the tone? The closer that I get to 40, the more I notice a nagging indicator reminding me that middle age is just around the corner. It's not random joint pain, nor is it my newfound difficulty in keeping off the pounds. It's not my thinning hair, or the scraggly gray whiskers that poke out from the sides of my head. It's my preferred gaming schedule. Back in my prime, that glorious time between my late twenties and early thirties when I was still young enough to maintain a sturdy constitution but old enough to have a solid career with steady, game-purchasing income, I loved to end my day with a great role-playing game session. We'd kick things off at 8pm or 8:30, play until midnight, and often I'd still have the endurance to craft our post-game write up afterwards. Then, around 2am I'd finally settle in front of my PlayStation and crank out a couple hours of Final Fantasy VIII. But as I worked my way up into my mid-thirties, I noticed that those long evenings started to shorten. First it was the late night computer or console gaming that disappeared. No worries there. I've had my fair share of accidentally playing a game like Master of Orion or Civilization until my alarm went off and I somberly realized that I would either need to drink a gallon of coffee or try to call off work for the day. Next went the late night adventure recaps. 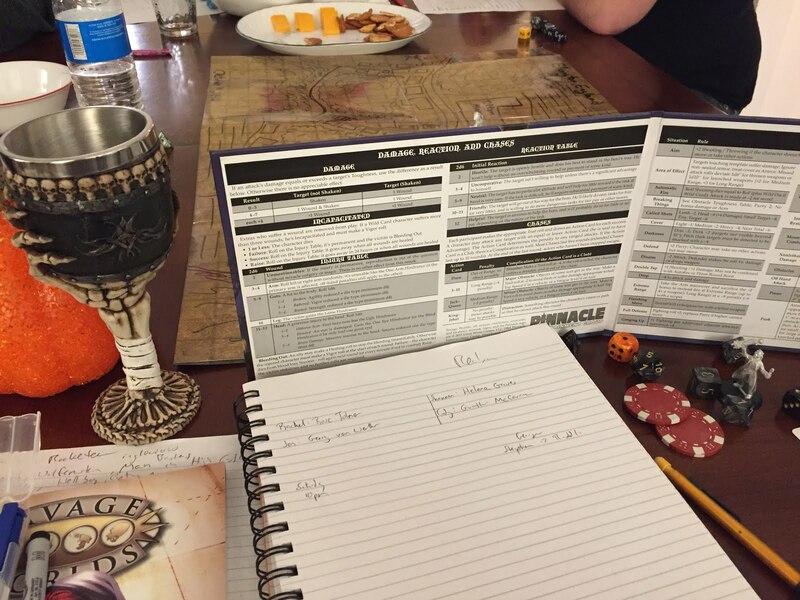 Even prior to my blog, I used to do adventure write ups after each and every gaming session. But instead of writing them after midnight, I started waiting until the next morning. The last thing to go was the 11pm to 12am hour of gaming. I'm just no good after 11pm, no matter how much coffee I've had beforehand. Gaming in person after 11pm isn't too bad, but gaming online knocks me right out, even if I'm the GM. Don't even ask me to play in an online game that'll run after 11pm. My new favorite time to game? Afternoons. My 2pm to 6pm schedule over at The Games Keep in West Chester, PA, is absolutely perfect. Just after lunch, so I've got a full belly, but safely before dinner so that I don't have to worry about spending money on take out. Sundays are especially great for this schedule, as I don't have to get up to early and I still have adequate time to prep in the morning while slurping down one or two cups of coffee. Running games isn't too bad in the morning, but my "pre-10am haven't had enough coffee grumpiness" is best suited for electronic gaming where I don't actually have to interact with any real people. We used to run some Dunkin and Dragons gaming with the kiddos, but those games didn't start until way later in the morning. Like 11am. Heck, that's practically afternoon. 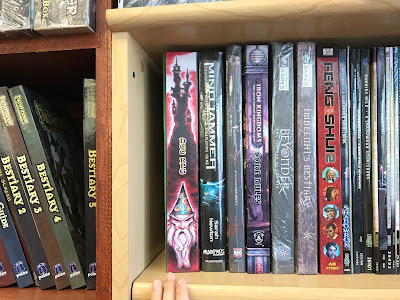 I've still got a couple games a month that run later into the evening, most notably my Purple Planet campaign beginning at 8:30pm, and typically ending a little after 11. All I can think about after those games is "damn, that sure was a late night!" I truly wish that I could still stay up super late, as I don't feel like I have enough gaming in my schedule right now. But with my new work schedule eating up most of my weekdays, and kids activities jacking many of our evenings. Over the next few weeks I'm going to be making an attempt at setting up a regular, long-term, biweekly (or is it semi-weekly?) Sunday afternoon game during that most special time slot of 2pm to 6pm. Here's hoping that I can find a few players who share in my delight of an AARP-approved, early bird special schedule RPG session. Sundays from 2 to 6 may work great for me and my schedule now, but I'd love to hear about your perfect game time. When running for your home groups, do you prefer a late night gaming schedule, or something way earlier in the day?